Is It Just Me? by British comedian Miranda Hart might not prove to be everyone's cup of tea. I'll tell you that right up front. I will confess to you though that despite her sometimes crass humor, I find her to be absolutely hysterical. I had no idea who she was for the longest time (having formerly been a Call the Midwife hold-out). When I started watching CtM someone (I forget who) mentioned to me that the character of Chummy, who I professed to like, had her own television show. The person who told me this wasn't familiar with the show or anything, they just happened to know of its existence. Curious, I looked it up. (You can watch the first episode free on Vimeo.) Again, I do warn you that her humor is regularly crass so avoid it if you'd rather not be exposed. (So why am I watching it, you wonder?) I can't really explain why I like Miranda Hart. I just do. I've never been a "cool" and "with it" person and neither has Miranda. I guess in someways I just "get" her (so no, it's not "just her"). It's humorous to me the specific ways in which she pokes fun at society and also herself. She definitely takes note of the behavioral quirks of people which is something I do also. At the same time, she's a jolly person who absolutely loves life and enjoys enjoying it with others. After having barreled my way through the available three seasons of Mirandra, I was missing her humor. When I discovered she had a book out I was very interested to read it and I am glad that I ultimately did, even though I can't fully recommend it to others. I was sorting of having a "bad day" when I picked up Is It Just Me? . It had been a long week with its own frustrations and I just felt the overwhelming need to laugh. (You know how that goes, I assume....) Enter: Miranda Hart. Her book reads off very much like her sitcom. It certainly helped to be able to "hear" her voice and understand the facial and body expressions she describes herein. It made all the difference. The only mistake I made in reading this book was beginning it in public. There I was sitting in a restaurant happily cracking open the cover and reading those first pages. First there was a chuckle. Then there was a full on body shaking laugh. Then came the tears of laughter. Then came the overwhelming and desperate desire to try not to draw attention to myself. Then my nose started running for trying to hold the laughter in and I realized it was only going to continue to get worse. I had to quickly set the book down in order to make the effort to compose myself, but the giggles kept coming and I eventually had to get up and leave. I came home and finished reading the book while my children were down for naps. I was laughing so hard that when my daughter came out of the room she said, "What were you reading today? Can you read it to me? It sounds funny!" No, I did not read it to her but I thoroughly enjoyed it for me. In this book Miranda Hart talks through life's many and varied trials, from advances in technology to going to the hair dresser. (She hates going to get her hair cut and I identified with every word she spoke on that topic. I probably laughed the hardest at that part. Stomach clutching laughter.) I find that my attitude matches hers when it comes to diets, beach vacations, weddings and what it's like not to be the "hippest" person in the crowd (but possibly the most comfortable one). It's hilarious. I loved it. And it was just what I needed when I needed it. 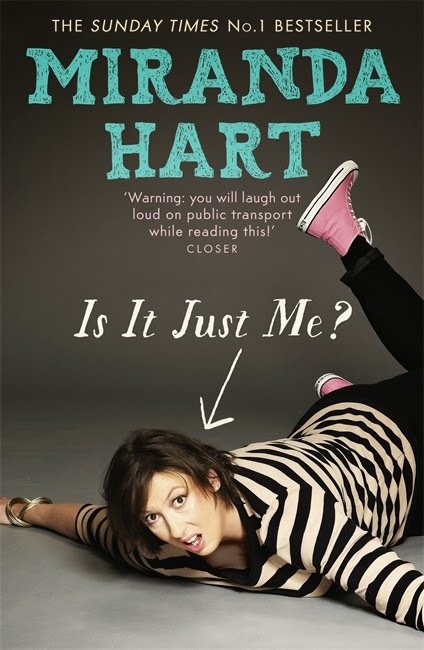 If you're curious to learn more about the comedy of Miranda Hart checkout her self-named show. That's a good starting point. I love your description of reading in public. And if it made you laugh it will probably make me laugh, so I might have to find this one. I've never heard of her, but the books sounds funny. Unfortunately it's hard to find humorous stuff without crassness these days. Thanks for your review of this book, I enjoyed reading it! But Miranda, crass? I don't understand. The most commonly-used words to describe her brand of humour are things like "innocent", "old-fashioned", "joyful" and "child-like". She took over a decade to get established as a comedian exactly because her comedy ISN'T crass like other popular acts! What specifically would you describe as crass in her work? The word crass means unintelligent, crude, insensitive, unrefined. Her work is incredibly intelligent, and hyper-sensitive to every nuance of social awkwardness. Do you mean she is sometimes a bit rude? The 'rude' bits are mostly just child-like humour, laughing at social awkwardness like farts and falling over. This is interspersed with clever funny word-play, and so much more. Her stand-up show was rated merely R12. She's about the mildest comedian in existence! I've read pretty much everything about her, and never heard her described as crass before, she's the classiest funny lady around. The audio version of her book 'Is It Just Me?' is even better than the written, as she acts out the voices for herself and little M, and adds a whole extra dimension to the experience. Miranda's favourite book is "You are special" by Max Lucado. She has raised millions of pounds for charity through Comic Relief and Sports Relief, for needy people in Africa and the UK. She has been a regular church attendee, and ironically would likely fit your definition of 'Christian'. There's no need to feel guilty for enjoying her humour, no need for scruples in fully recommending this book and the other ways in which Miranda shares her God-given gift for making people laugh and feel happier. I'm so glad you read her book and found it just what you needed, when you needed it. Isn't it sad there will be no more episodes of her sitcom since she wrapped it up in the Christmas specials? I'm hoping she will find other ways to share her humour, and continue making the world a better place.